Gillian Roberts is a figment who employs Judy Greber (the author of four mainstream novels in which people die, but nobody cares whodunit ) to ghostwrite for her. 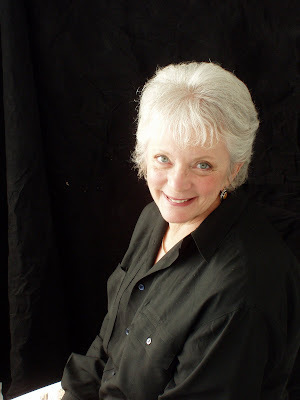 “Gillian” titles include two mysteries set in Marin County, Time and Trouble and Whatever Doesn’t Kill You, a how-to, You Can Write a Mystery, a short story collection and the fourteen books in the Anthony Award winning Amanda Pepper series. Judy’s taught writing at College of Marin and Book Passage, and was adjunct faculty in USF’s MFA in Writing Program for a dozen years. Currently, Judy is working on a ridiculously-difficult-to-research historical mystery. What Gillian’s been doing these past few decades remains a mystery. Virginia Woolf famously said “a woman must have a room of her own if she is to write fiction.” She also said she must have money, an (inherited, she meant) income. Nonetheless, I wrote my first book, Caught Dead in Philadelphia, without a room of my own, and my income was a (small) paycheck for teaching an overloaded roster at a private school. When I could steal an hour from my crowded life, I wrote at a small desk in a corner of the bedroom. So there I’d be, totally happy in my stolen moments with only the Selectric and the pictures in my mind, which should have set up a red flag. Because too often, a child would wander, as if in a trance, into the room and turn the typewriter off because...well, he wasn’t sure why. And one infamous sunny Saturday afternoon, when I was writing, the bedroom door opened and in came my husband and our two sons--plus a deflated basketball and a bicycle pump. The trio seated themselves cheerfully on the bed and proceeded to pump up the ball. After I had regained the ability to speak (okay, the ability to screech) I asked, “WHY? WHY INSIDE? WHY IN HERE?” Their reactions were straight out of a cartoon. Mouths agape, eyes popping, they looked at each other, at me, at the basketball, at their surroundings, even more bewildered than I was. We worked on that and reached a shaky peace, but naturally, when we moved again, I was thrilled to acquire a room of my own, even if it wasn’t quite a room yet. My office began life as a diminutive deck off the kitchen. The next owner turned it into her pottery workshop, but it was a peculiar half-inside, half-outside sort of place as if she couldn’t commit to clay vs. porch. The walls were brown shingles, the original exterior sliding glass separated me from the hallway, and an enormous window looked into the kitchen. It is a weirdly uncomfortable experience to do your thing in a room with three glass walls, unless you’re a guppy. Over the years, we removed the shingles, made the kitchen dividing wall solid, put down wood floors, and created a normal interior doorway. To cap it off, and my husband built me my (enormous) dream desk. The former porch has no subflooring, so it’s the hottest place in the house in summer, the coldest in winter. And the desk apparently isn’t sufficiently enormous to avoid being cluttered 99% of the time. Doesn’t matter. It’s mine. I’d always heard that a writer should face a blank wall in a spartan room in order to avoid distractions, but I’d rather eat glass than stare at a blank wall all day. Bad enough I stare at a blank screen and try not to think about my blank brain--adding to that emptiness would be masochistic overkill. I therefore work in an absence of blankness. In back, glass doors face a garden bursting with life. And even if that were not so, I’ve filled the room with a medley of chatchkes and treasures. 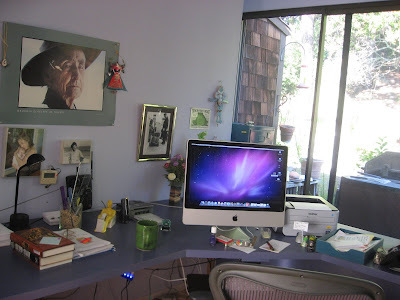 Above my desk, a poster of Georgia O’Keeffe scowls down at me. I look up at her amazing weathered face and I hear her saying, “I’m ninety and can barely see, but I’m still painting. How are you using your time, Missy?” Pinned to the poster is a tin angel that quotes James Michener with the words, “I love the swirl and swing of words as they tangle with human emotions.” On the bookshelves across the room, I can see my past work, and on my bulletin board, a book-shaped milagro. I’m therefore surrounded by all the varieties of help I can find--nagging, encouragement, a reminder that I can do it (or at least, could), and most definitely, miracles. Near Ms. O’Keeffe, there’s a photograph I bought at a street market in Argentina. It shows a well-groomed member of the public looking down at a seated lump of a man, his beard unkempt and his pathetic possessions in a shopping cart topped by a hand lettered sign that says, in Spanish, “Poetry for Sale.” They didn’t have one that said, “Mysteries for Sale,” but I feel a kinship with that guy and am also afraid of becoming him, so he’s another prompt to get to work. There are lots of things that amuse me. Frogs of many shapes and materials. Souvenirs from trips, gifts received and treasured. A charcoal drawing I did of my husband. The girl and boy bookends that were in my nursery, several millennia ago. A clock with no numbers. Instead, in place of the 12, it says, “read a book, ” and “read another book” at 12:15, and “read yet another book” at half past the hour and “buy more books” at a quarter of anything. And then, there’s my waste paper basket. When I sold my first book, I spread my world-class collection of rejection slips out, chose only one per publication and glued them to an industrial-sized basket. For the twenty-nine years since then, I’ve looked at the collage: J. B. Lippincott, Young Family, The Saturday Evening Post, Atheneum, Girl Talk, McCall’s--so many others--where are you now? Maybe if you’d published me...? Probably not, but it still gives me pleasure to use it for my rejects. One caveat: it isn’t truly a room of my own. 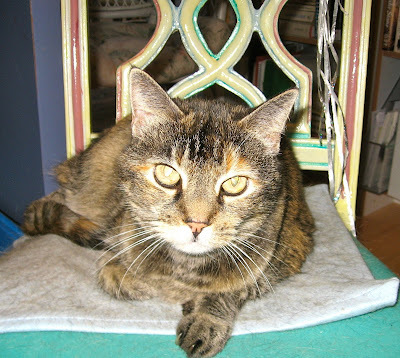 I share it with an aged, ill-tempered tabby cat, Mehitabel, who keeps me company while I write. I am sure she does this is out of love and literary interests, not because I have a heating pad on ‘her’ chair. She’s named after the wild, sluttish tabby in the terrific Archie and Mehitabel books, which I hope you already knew. If not--highly recommended. I, of course, am Archie, the typing cockroach. I think of her as my muse. She thinks of me as her amusement. It works. Virginia and all the writing experts would disapprove of what I’ve done with my room. They’d see a small, cluttered space with too many distractions, and they’d be right. But I see a room truly made my own. And I see stories everywhere around me--the stories of my life. Virginia Woolf was a genius, but still a bit wrong about the necessity of a room of one’s own (let alone the income.) 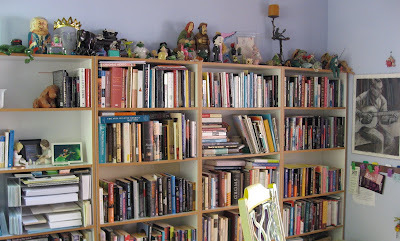 It is indeed lovely to have one (lovelier to have both), but the truth is, despite all the distractions around me, at those miraculous times when a brand-new story takes shape in my imagination, I barely notice the walls and shelves. Not even the wastepaper basket. awesome room. my son just moved out, so I'm thinking of taking over his room for my own. Wonderful post. Thanks for this. I'm ashamed to say that I've never noticed the waste basket. What a wonderful idea! A source of continued encouragement. I, too, have a Michener-quoting tin angel (a gift from you, of course). It's as good an inspiration as the view of the GG bridge outside the window. How lovely to see you here! I love the photos of your work space. My last office was in the middle of my son's toy room, so it's no wonder I mostly wrote at cafes! 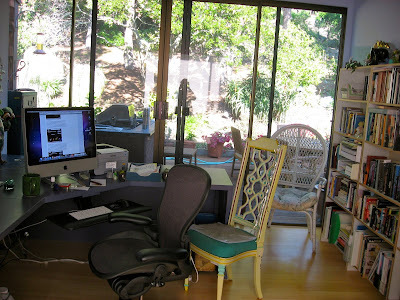 I just acquired my own office in our new house--and I'm the proud owner of two windows to the outside. I find it very inspiring to see the sky. Thoroughly enjoyed the blog! It got me thinking of the spaces in which I've written, and the need for - not so much a room of your own, as an acceptance of you are, and a validation of both the journey and the destination. Meredith, I'm so glad you've got your own space--not surrounded by your son's toys anymore. And I love that Louise and Meredith are also able to create terrific books even while looking at much more than a blank wall. 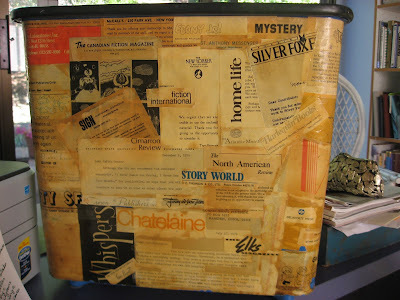 Love the post -- especially the 'rejection' wastebasket. And 'midden' is a pretty apt description for my own writing space. I love your room. I need a room, because right now I have a tiny desk in our guest room. No place to spread out. Hope you have a wonderful holiday Kaye. As a writer who works in a closet (and I do mean a closet, like, it once held clothes) I second everything you've said here, Gillian! And an income--now you're talking crazy! Ah, but we can dream, and that's surely part of what you must do in that light-filled, inspirational space. Thank you for sharing it. Thank you, Kaye, for loving these sneak peeks enough to make us to bring some forth. And don't even get me started on the rejections covering a (waste?) basket. What a great idea. I once had the thought to make a toilet paper roll of 'em. But that was ugly of me. Probably I deserve most of those rejections. Wonderful post! It made me look at my own writing room with a fresh eye. I love my room and appreciate it each and every time I walk into it. It started with my dream desk, purchased about three years ago. A year ago, my dream desk chair joined it. It comes with the requisite feline Mewse (mine is a tortie named Amber), and I'm surrounded by things I love. The only thing missing is the iMac of my dreams....working on that one. Love the photo in your blog's header! I truly enjoyed this post. Thank you. J/G, You've given me the vision that if I just clean out that back room, call the heater guy to fix the radiator and the electrician to put in PC-worthy outlets, I too, might have a real office in my lifetime. I think I could work in that room, especially with Mehitabel to share it with. I LOVE that room, and its wealth of goodies. Thanks for dropping by everyone - and thank YOU Judy/Gillian!! Hugs Hugs!! a whole lotta snowin' going on . . .
Christmas as a kid in Cambridge. to my dad.